Located in a popular residential area at the head of a cul-de-sac is this versatile family home. 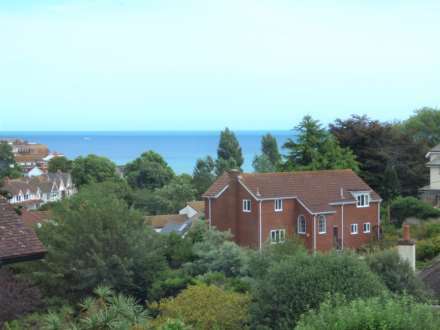 Superbly situated just off the main Dartmouth Road which provides links into Paignton Town centre with bus and train services to Exeter and beyond, or in the opposite direction towards Plymouth. 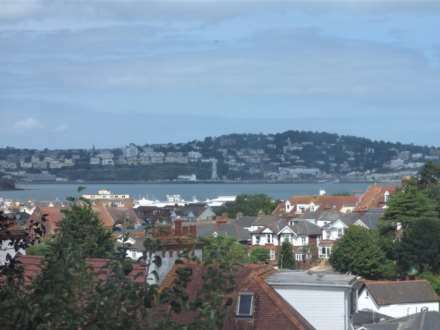 Just a short drive away are the Marinas at Torquay, Brixham and Dartmouth. 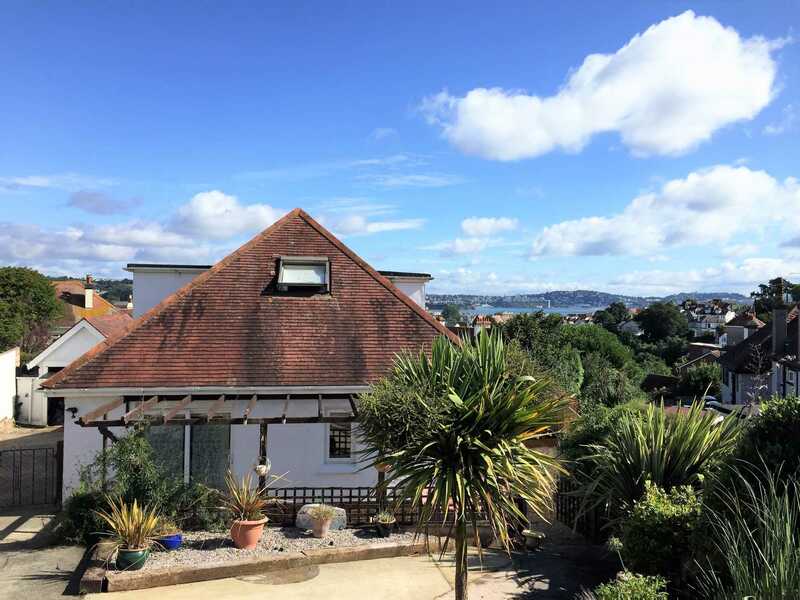 Right on the door step is Paignton Zoo, Clennon Valley Leisure centre with its Velodrome and the beautiful beaches at Goodrington which link to the South Devon Coast footpath. 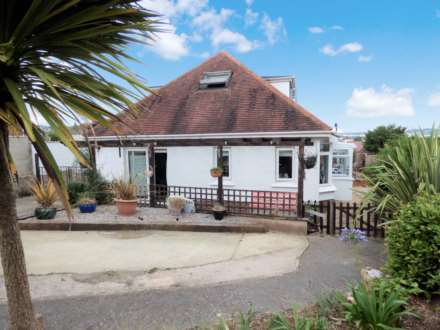 This home is ideal for a large family or maybe a dependant relative that wishes for their own space too. This detached home has 4 double bedrooms. Some sea views across to Torquay and Berryhead.. Gardens. Garage and ample parking. 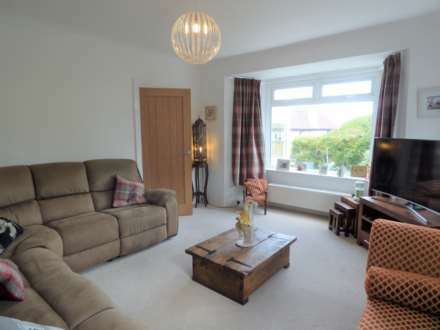 This detached home needs to be viewed internally just to appreciate the size and space this superb home has to offer. 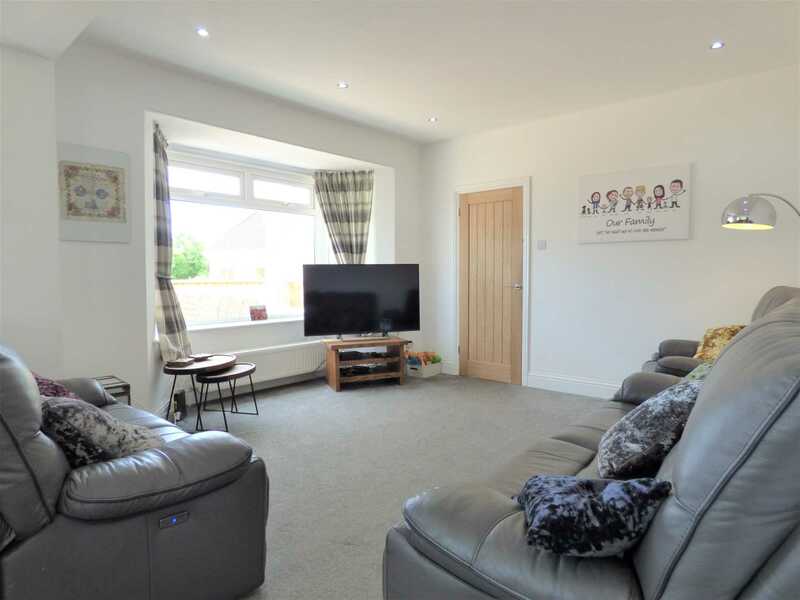 Stepping in from the reception hallway you have a really good size double aspect separate sitting room, a fantastic modern family living space with sitting, dining and extensively fitted modern kitchen. 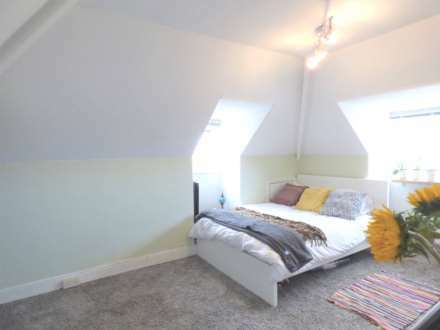 There are also two double bedrooms plus a refurbished bathroom. 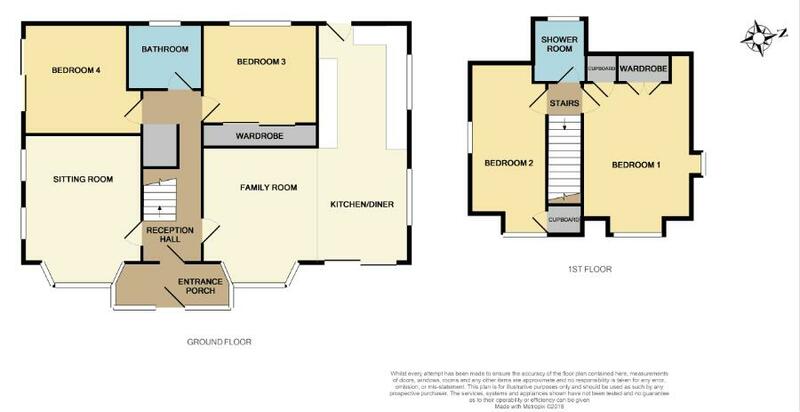 Whilst on the first floor are two further double bedrooms and shower room. Externally there is masses of space including off road parking for several vehicles (even camper van big enough !) detached garage plus gardens which sound the property..
Lovely double aspect room with windows to the front and window looking across Paignton to towards Brixham and Berryhead. radiator. TV aerial point. 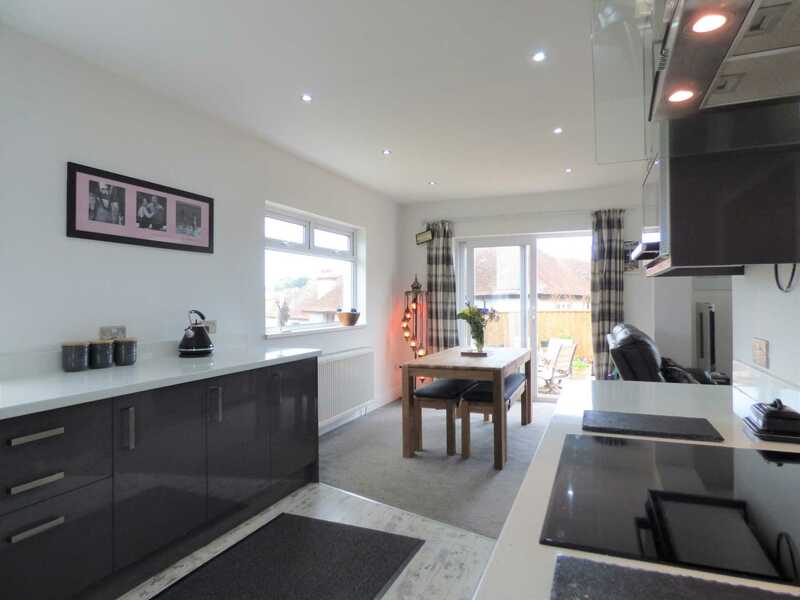 Kitchen/Dining Area 25`2" x 9`8" (7.67m x 2.95m). 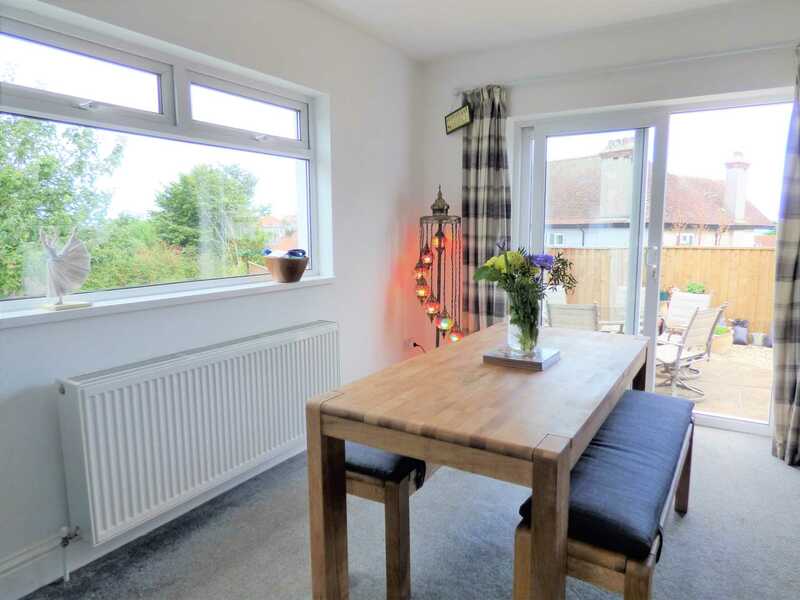 Dining Area has a further uPVC double glazed window overlooking the garden and patio doors opening onto a terraced area. The kitchen has that wow factor and is fitted to three sides with a stylish range of modern high gloss wall and base units. The base units are set beneath quality work surface with matching up stands and provide an extensive range of drawer and cupboard space including pan drawers beneath. 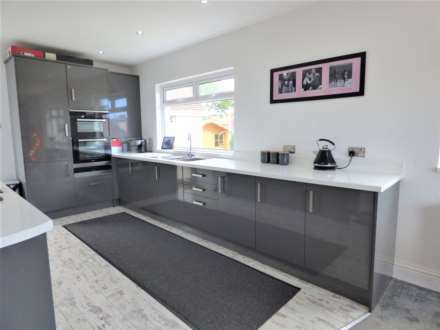 There is an inset stainless steel one and a half bowl sink unit with single drainer and mixer taps over, The kitchen is extensively fitted and provides a built-in high level double oven and grill plus warming drawer. Integrated fridge and freezer and dishwasher. 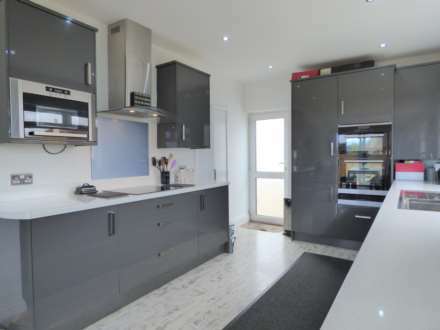 Four-burner electric induction hob with stainless steel and glass extractor hood over with glass splash back and an integrated microwave, There are matching wall mounted cupboards providing plenty of storage space. Recessed spotlighting, built-in storage cupboard, concealed gas boiler supplying domestic hot water and gas central heating. 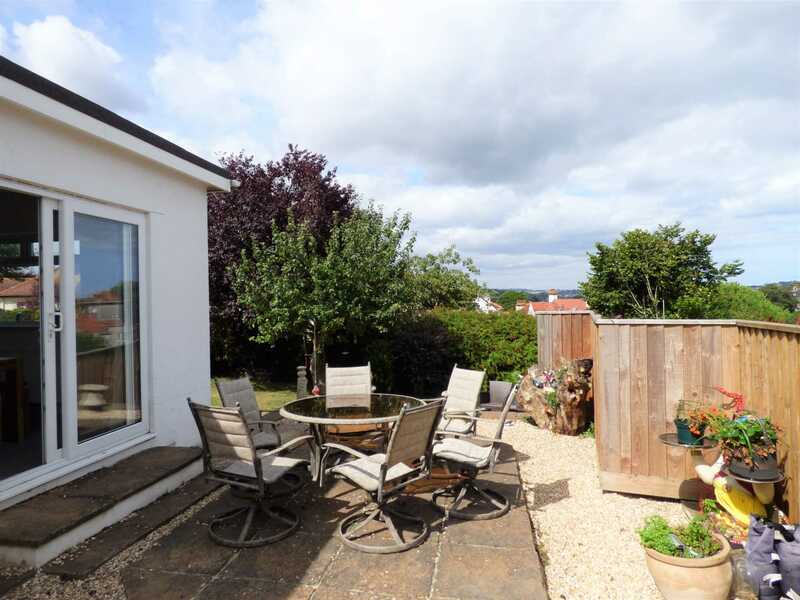 uPVC double glazed door to the side garden plus window overlooking the garden and across Paignton. UPVC double glazed patio doors opening onto a external patio area looking onto the garden. Radiator. To one wall is a built in floor to ceiling wardrobe unit with sliding door housing hanging, shelving and drawer space. uPVC double glazed window to the side. Radiator. 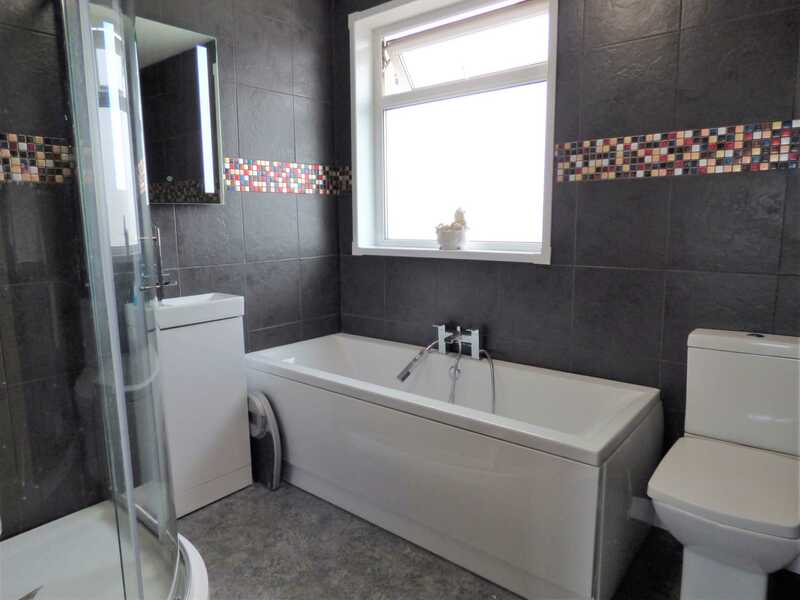 This has recently been refurbished with a modern white contemporary bathroom suite with contrasting tiled walls with decorative feature. The suite comprises of a square contemporary wash basin with mirror light over, low level WC and square double ended bath with central fitments. Separate step in shower cubicle with thermostatically controlled shower inset. Radiator. Obscure glazed window to the side. 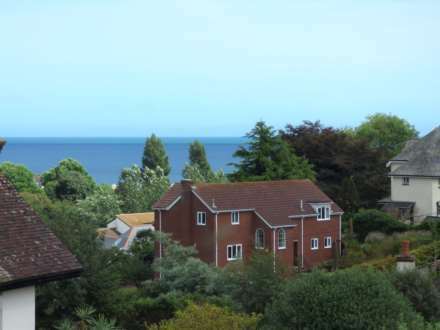 Enjoying a double aspect view through dormer windows. One window looks across Paignton to Torquay Harbour, Daddyhole Plain and out to sea. The other window has views across Goodrington and around the bay to Brixham. There is plenty of storage space available with some eaves storage, built in wardrobe with hanging space and a further built in shelved cupboard. Radiator. Another double aspect room with velux window to the front and dormer to the rear enjoying views across to Brixham. Eaves storage space. Radiator. Fitted with white suite comprising low level W.C, wash hand basin with built-in storage below, walk-in single shower cubicle with fitted electric shower. Floor to ceiling tiling, radiator, obscure double glazed window to rear, extractor fan. The property is approached through stone and brick built twin pillars, opening onto a concrete driveway affording off road parking for several vehicles, leading to a single Garage 15`8" x 9`6" (4.78m x 2.9m). Up and over door, light and power, currently used for storage. 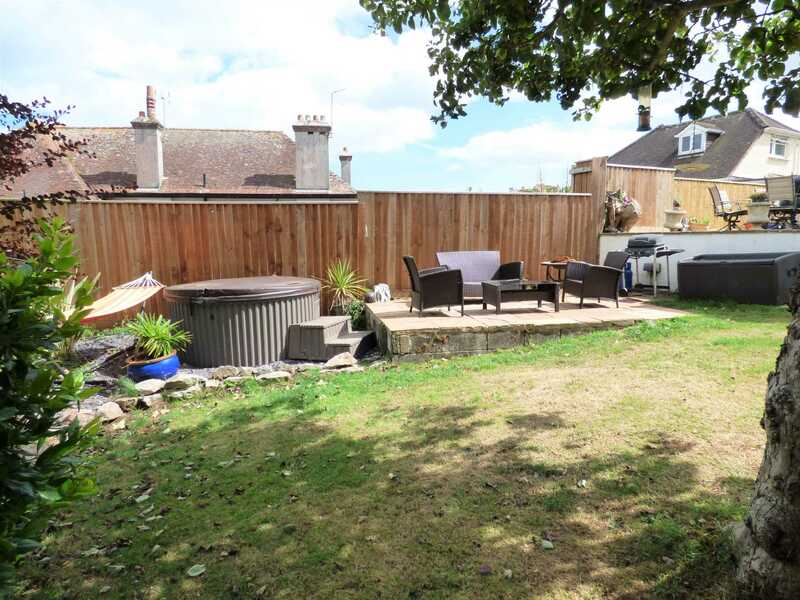 The front gardens have a rockery style raised borders with a patio area and pathway leading to the front door. The gardens actually wrap around three sides of the property, Continuation of the stone chipped path leads around into the rear garden. 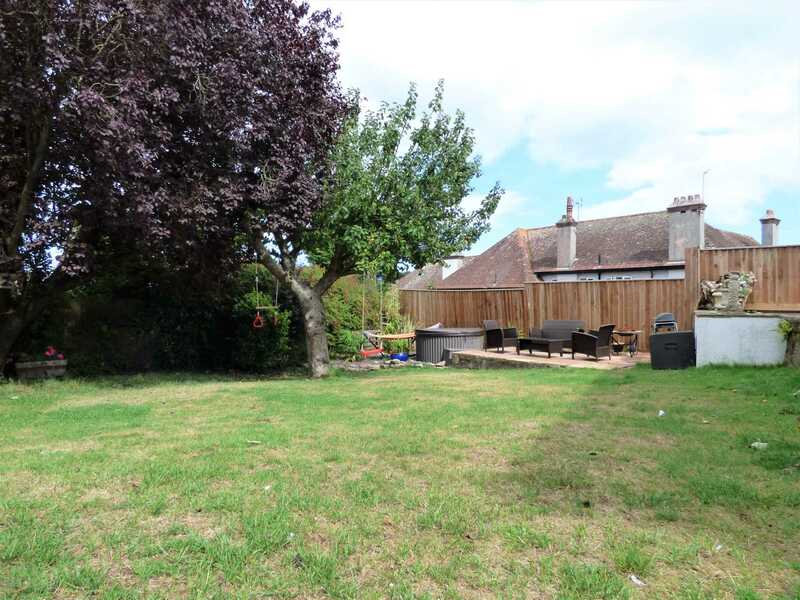 The good sized rear garden is largely laid to lawn with some mature trees, bordered by low level flower beds, with a raised bed to one corner, two paved patio areas laid for entertaining. The rear garden enjoys a good degree of sunshine and has both outside lighting and an external water tap.